Many people think of a mirror as one of many bathroom accessories that gets lost in the shuffle of your remodeled bathroom. However, this is a far more prominent feature than people give it credit for, and Better Homes and Gardens has a few tips to make it work for you. While an oversized mirror is a jaw-dropping accent for any washroom, it does little to improve the versatility of your space. One of the easiest additions you can make to your bathroom is a medicine cabinet and mirror combo. These furnishings can pair beautifully with your bathroom vanity, and can improve your storage space. If you're going for something a bit more minimalist, a mirror mounted on your wall could be a great choice. Invest in ball-shaped mounting brackets that can allow you to swivel the mirror in the direction you need. This can make the furnishing far more practical and can serve multiple purposes in your washroom. A mirror is one of the most significant purchases for your bathroom, so give the accent some serious thought before you decide on a model. 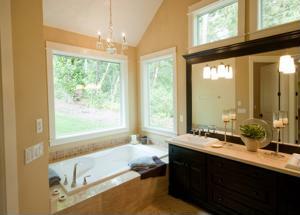 What decorative tips do you have for individuals looking for a new bathroom mirror?